Economic Development – Federal City Alumnae Chapter | Delta Sigma Theta Sorority, Inc.
Economic stability is a key element in creating and maintaining strong communities. To address the need for sustained and targeted actions that promote the standard of living and economic health of African American and historically marginalized communities, Delta Sigma Theta implements Financial Fortitude–a myriad of initiatives designed to promote the understanding of all aspects of the financial system, including budgeting, home ownership, personal wealth management, entrepreneurship, and the steps to financial freedom. 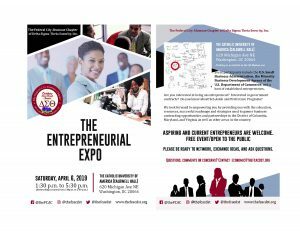 The “Entrepreneurial Expo” is designed for aspiring and current entrepreneurs to network, exchange ideas, and get answers to burning questions. It is free and open to the public. We look forward to empowering you. Download flyer and share it.